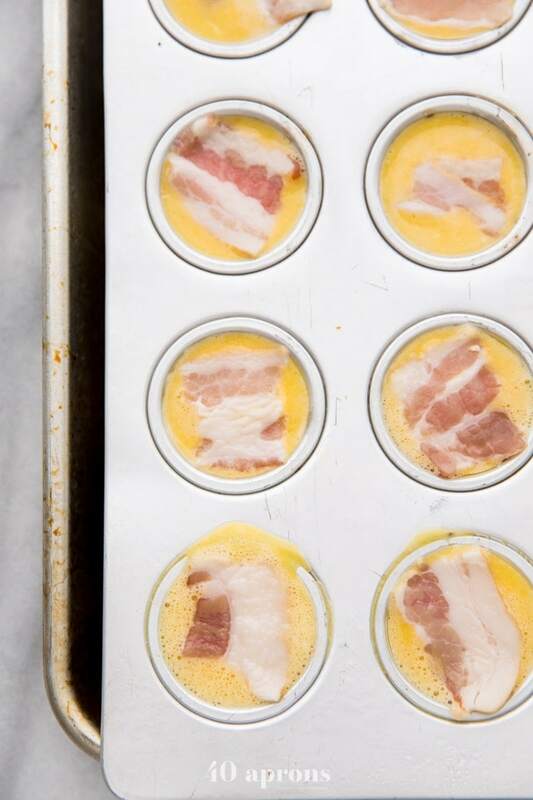 These sous vide egg bites with bacon recipe makes the richest and creamy egg bites but with no sous vide equipment necessary! Whole30, paleo, and dairy-free, they’re a healthy version, made in the oven, and are an awesome breakfast idea when you’re on the go. Inspired by the Starbucks method, once you learn how to make these bacon sous vide egg bites, you’ll make them all the time! If there’s one egg dish I’ll never tire of, it’s chocolate soufflé sous vide egg bites. Also chocolate soufflé. I fell in love with the sous vide method of cooking years ago when I read Thomas Keller’s book, Under Pressure, detailing just how powerful it can be to cook vacuum-sealed foods in a water bath with a controlled, steady temperature. Instead of overcooking the edges of food so you can properly cook the inside, the sous vide method allows you to cook at extremely exact temperatures, cooking, say, a chicken breast all the way through but not one degree overcooked, by simply cooking it sous vide at the desired temperature. The resulting foods are almost always super tender and rich, never dry or overcooked. And if you’re really up for some entertainment, you can see a couple of my old sous vide recipes (Sous Vide Smoked Salmon Hack and Sous Vide Beer Cooler Hack + Steak) that use a funky hack (A beer cooler!) and really, truly awful photos. So… OK. Now I’m mortified, but also justified because, while the photos are terrible, the recipes are fantastic. So, as much as I love the sous vide egg bites are Starbucks, especially the bacon sous vide egg bites, I don’t always want to consume a bunch of dairy to go with it or spend something like five or six bucks for a couple of those rich, insanely velvety egg bites. Not if I can make them at home! 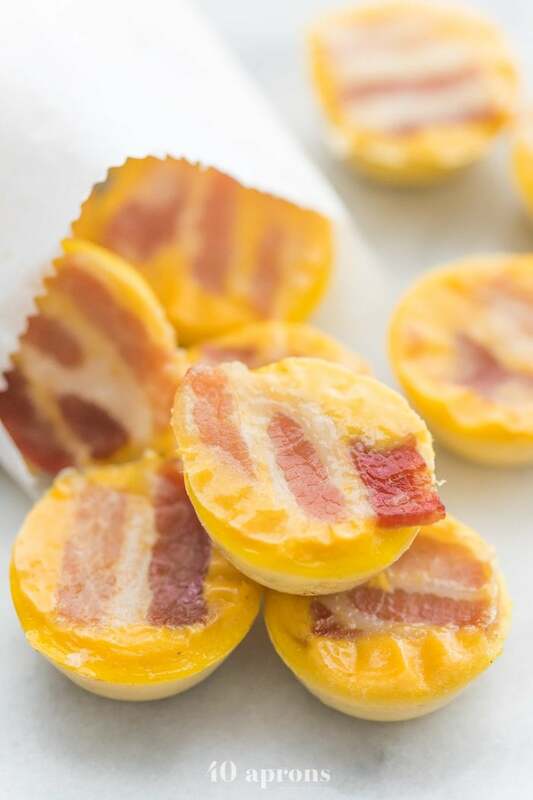 These bacon sous video egg bites are oh so rich, creamy, and healthy! They’re made in the oven and don’t require any special equipment. Topped with salty bacon, these sous vide egg bites are totally loaded with flavor. They’re surprisingly easy to make, and once you learn how to make them, you’ll have a batch in the fridge all the time! These sous vide egg bites are a great portable breakfast, and they’re healthy, dairy free, Whole30, and paleo. Try swapping out the bacon for a sprinkle of chopped roasted red peppers for a vegetarian version. Stir in a handful of white cheddar or gruyère if you eat dairy. Bonus points for raw dairy! Stir in chopped fresh herbs for even more flavor. Start by making your creamy cashew sauce. This is what gives the sous vide egg bites recipe such a rich and creamy flavor and texture! Soak some raw cashews with hot water for about 30 minutes – simply cover the cashews with hot water then drain when ready to move forward. Blend together the cashews, drained, tahini, lemon juice, apple cider vinegar, and water until extremely smooth. In a separate bowl, whisk the eggs very well, then pour in the cashew mixture. Stir well and add salt. Now the sous vide part! Prepare your pan: spray a mini muffin pan with spray refined coconut or avocado oil. Alternately, use a silicone mini muffin pan, and you can skip the spraying. Place the muffin pan on a baking sheet, then pour the egg mixture evenly into the muffin cavities, a little more than 3/4 up the sides. Place a small piece of bacon, the width of the muffin cavity, on top of the egg mixture. Fill a measuring cup with a handle and spout with water then pour this water into the baking sheet until it’s about halfway up the muffin tin. Very carefully place this pan in the oven and bake at 200º F for 90 minutes. Check the egg bites and press on the top of one. If it’s solid and slides around a bit, they’re done! If they’re at all liquid and don’t seem solidified yet, keep baking, checking every 15-30 minutes. Ovens will vary, so find the time that works best for you and go with that! Once they’re cooked through, remove carefully and take muffin pan out of water bath. Remove egg bites from pan, running a toothpick or paring knife around the edge if necessary. I like plopping a piece of raw bacon on top of my egg mixture since it cooks in the oven and cuts down on prep time. However, if you prefer a little darker or more cooked bacon from the get-go, simply fry up about 6-8 slices bacon about halfway to crisp then drain and cut into pieces that are the width of the muffin cavities. How long do sous vide egg bites last in the fridge? You can keep these about 5-7 days no problem! Are these sous vide egg bites keto or low carb? They are! They’re both low carb as well as keto friendly. Eat up! 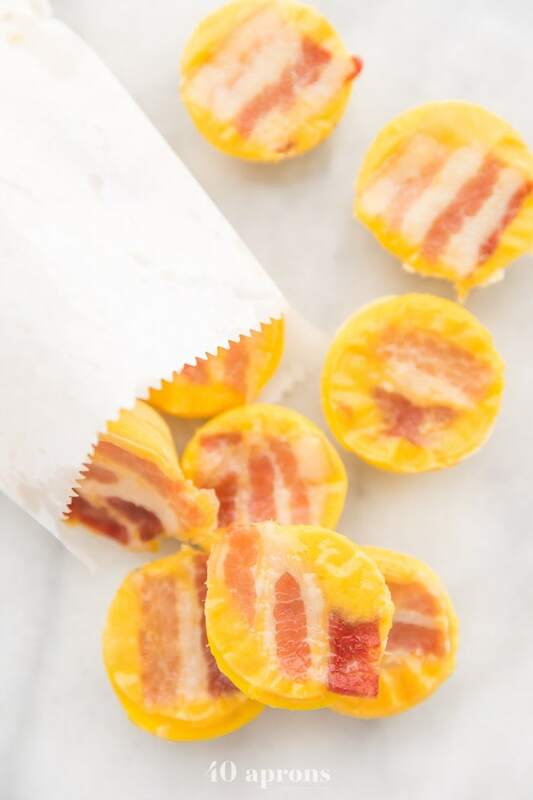 Rich and creamy healthy, dairy-free sous vide egg bites with bacon, made in the oven with no fancy equipment. In a high-speed blender, process cashews, tahini, lemon juice, apple cider vinegar, and water on high speed until completely smooth. In a large bowl, whisk eggs very well. Stir in cashew mixture and salt. Prepare a mini muffin pan by spraying with refined coconut or avocado oil. Alternately, use a silicone mini muffin pan and skip the spray oil. Place muffin pan on a baking sheet. Fill muffin pan with egg mixture a little more than 3/4 full, then top with a small piece of bacon the width of the muffin cavity. Pour water into the baking sheet about halfway up the sides of the muffin pan. Carefully place in oven and bake for 90-180 minutes or until when you press on them, they slide around easily and are no longer liquid. Each oven will vary with such a low temperature, but keep an eye on them so they don't overcook! Test every 30 minutes after 90 minutes to see if they've fully solidified with the press test. If you have a high-speed blender like a Vitamix, you can skip soaking the cashews, although it will make the mixture even smoother and more velvety!